VAT Invoice Available on Request. 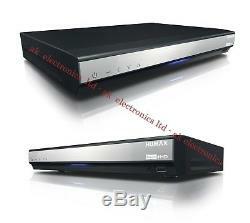 Humax HDR-2000T Twin Tuner Freeview HD Set-Top Box 1TB HDD PVR Recorder. LAN, HDMI, Live Pause, USB, Chase Play, BBC iPlayer, YouTube. UK Stock -Free HDMI Cable included. Ex Display product from major UK HiFi store- May carry light marks or signs of use. Comes in replacement or original box -depends of stok level. Remote control, charger, free 4k gold plated hdmi cable, batteries and main lead. New Freeview HD Digital TV recorder. Integrated hard drive with 1TB capacity. Over 50 Digital TV Channels including free HD channels from BBC, ITV and Channel 4. Record 2 channels at the same time. 8-day on screen electronic programme guide. Perfect digital transmission for picture and sound via HDMI output. Play media from a HDD or USB memory stick (MP3, JPG, XVID). Receives SD programming as well as HD programming. Resolution formats: 1080p, 1080i, 720p, 576p, 576i. Standby power: less than 1w. This product will require an aerial to receive Freeview channels (this is not a satellite product). The Humax HDR-2000T is a feature-packed, Freeview+HD digital TV recorder, bursting with recording, multimedia, home-networking and on-demand services for the ultimate subscription-free TV experience. Simply plug the HDR-2000T into your HD-ready TV to enjoy high definition (HD) content, as well as access to up to 50 Freeview standard definition TV channels & 24 radio channels. Connect the HDR-2000T to your HD-ready TV to upscale to full 1080p HD and enjoy the intense images and vibrant colours of HD channels from the BBC, ITV, C4 and S4C, all subscription-free. The box will also upscale standard definition programs, making sure every image looks as fantastic as possible. Sound is also crystal clear as the HDR-2000T boasts Dolby Digital Pulse Audio Output for an unrivalled, all-round viewing experience from the comfort of your sofa! Boasting a massive 1000GB hard drive, the HDR-2000T can store up to 250 hours of HD programming or up to 600 hours of standard definition shows. Twin tuners for simultaneous recording. Avoid arguments over missing a show, as the twin tuners mean you can watch one programme while recording another channel at the same time. You can even record two Freeview channels simultaneously if you are watching a recording from the hard drive. The Humax HDR-2000T is packed with smart recording features to give you complete control over everything you want to watch. Missed that crucial goal or a scene in a movie? Simply rewind live TV to replay the action. Now you can record an entire series at the touch of a button. When you select a show for recording, series recording will give you the option to record the whole series, so all the episodes of your favourite show will be saved automatically. S no need to wait until the programme you are recording has finished before you can start to watch it. With chase play you can start watching from the beginning even while the rest of the programme is being recorded. S no need to worry about missing a recording if the programme schedule changes, like a football match going into extra time or a breaking news flash. Schedule tracking starts recording your programme only when it starts being broadcast, so your recordings are always accurate. Have you ever been annoyed that you? Ve recorded a film only to find the recording has stopped when a news break kicks in? Split recording lets you record two-part programmes with a break in the middle, so you don? T miss the second half. Alerts you in an instant if a clash occurs when you try to record a programme and suggests an alternative time to catch the show if it? S repeated or being shown on another channel. If you are viewing a programme in standard definition or set a programme to record, and the same programme is available in High Definition you will be given the option to view or record in HD. When setting a recording, the broadcaster may suggest a similar programme that you might want to record. Green Button (also known as Trailer Booking). Allows you to schedule a programme to record during a trailer (or preview) of a programme without having to search through the programme Guide. Prompt will appear on screen and when the green button is pressed you can set the programme to record. The above Freeview+ HD features are available on channels where the correct and accurate data is being broadcast. Some channels may not support all of the Freeview+ HD services. The Humax TV Portal is your gateway to a host of extra catch-up and on-demand services. Simply connect the HDR-2000T to your home broadband connection, either by Ethernet cable, powerline adaptors or a Humax wireless dongle, to access services including YouTube, BBC iPlayer, and Internet Radio. Additional services to be added in the future. The HDR-2000T offers exciting multimedia and home networking capabilities, making it the hub of any home. Play media content including photos, videos and MP3s directly onto your TV using a memory device in the USB port, or connect it to PCs or laptops around the home through your home router, using the Ethernet port. Your friends and family will be able to see your holiday moments without having to crowd around your digital camera, so there? S no chance the family can avoid that slideshow! Share your recorded programmes from the HDR-2000T with other compatible devices around the home via your home network. This eco-friendly digital TV recorder boasts less than 1 watt power consumption in standby mode, ensuring energy efficiency. Software upgrades happen automatically when the box is in standby mode, so there? S no excuse to waste more energy than necessary and you can save yourself a bit of cash on the electricity bill at the same time. The product comes with an auto-standby feature meaning that if you forget to switch it off it will automatically go into standby if inactive for 3 hours. Ve removed the HDR-2000T from its box, set up is super quick and very easy. Every box comes with an HDMI cable for perfect digital transmission of HD pictures and sound. Other features include parental control for peace of mind, subtitle and audio description, and an easy find function to search for programmes in the guide. MPEG Transport Stream A/V Decoding. 4:3, 16:9, Letter box. 1080p, 1080i, 720p, 576p, 576i. 1 (2-in-1 Color: Red in recording, blue in operating and red in stand-by). Version 1.4a (with HDCP). Size (W x H x D). 320 x 50 x 245 (mm). This only applies to items sent by Parcelforce, CityLink and MyHermes. Proof of posting will be available. Some drivers will not allow you to open the item to check it, if this happens sign your name with the word "UNCHECKED" next to it as then a claim can be made if damage is found later. We guarantee these items to work on arrival as they are checked and packaged by us before listing and dispatch. If an item does prove faulty when it is received then a replacement will be sent out once we have received the item back and confirmed its faulty and confirmed the serial number and our security mark. (We must be contacted within 12 Months of you receiving the item). Please note that you will be responsible for the postal costs of returning the item. When a parcel leaves us, it leaves in perfect condition, When received if there is any damage to the parcel or packaging this would have happened whilst in transit, So please take a time to inspect your parcel before signing for it as no claims can be made if you accept a damaged parcel and don't sign for it as damaged. If you dont have time to inspect the item please sign for it as unchecked, In the unlikely event of a item being faulty, when returning to us please ensure you include the item number in with the parcel as well as a description of the fault and your return address, failure to do this will result in a delay in replacing the item.. We will not accept items back if they are not in their original packaging. All items are discreetly security marked and serials number noted to aid fraud prevention and any attempted fraud reported to the relevant authorities immediately. Any legal costs are passed on. The item "Humax HDR-2000T 1TB Twin Tuner Freeview HD Set Top Box HDD PVR Recorder HDMI USB" is in sale since Sunday, October 21, 2018. This item is in the category "Sound & Vision\DVD, Blu-ray & Home Cinema\Hard Drive (HDD) Recorders".ltd" and is located in Norwich. This item can be shipped to European Union member countries.